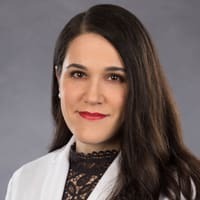 Anna Nichols, MD, PhD is Assistant Professor in the Department of Dermatology & Cutaneous Surgery at the University of Miami Miller School of Medicine. Dr. Nichols’ clinical and research interests are focused on preventing nonmelanoma skin cancer, developing novel, cost-effective ways to treat tumors non-invasively, complicated medical dermatology and integrative dermatology. She spearheads a High-Risk Skin Cancer Clinic dedicated to serving patients at risk for multiple or aggressive nonmelanoma skin cancers, such as solid organ transplant recipients. She was recently awarded the 2018 Skin Cancer Foundation Research Grant to test the novel hypothesis that intratumoral delivery of the 9-valent human papillomavirus vaccine is an effective treatment strategy for cutaneous squamous cell carcinoma. Additionally, Dr. Nichols is the Co-Director of the department’s Clinical Trials Unit where she oversees a team of research coordinators and fellows who support the department’s numerous research projects. She is currently involved in projects on skin cancer chemoprevention and treatment, inpatient and emergency department dermatology consults, psoriasis, hidradenitis suppurativa and androgenetic alopecia. She is a member of the University of Miami’s Institutional Review Board.